The European Union (EU) preens itself on being the global leader in the fight against climate change. EU politicians scold the USA for ‘failing’ to ratify Kyoto Protocol and enact cap-and-trade. Within the EU, the UK champions the most aggressive climate policies. So the UK’s carbon footprint must be shrinking, right? Not according to a new report by the UK’s Department for Environment, Food, and Rural Affairs (Defra). The UK’s total net carbon dioxide (CO2) emissions rose 35% between 1990 (the Kyoto Protocol baseline year) and 2005. Emissions declined by 9% from 2008 to 2009 due to the worldwide recession. Nonetheless, the country’s carbon footprint was 20% bigger in 2009 than in 1990. How can this be? Defra used a life cycle analysis (LCA) to estimate the UK economy’s net emissions. The agency examined not only the CO2 emitted by households and firms within the UK but also the emissions induced by the UK’s demand for imported goods. Carbon dioxide is emitted when goods are manufactured for export in, say, China, and then again when those goods are transported to the UK. Emissions “embedded” in UK imports are increasing much faster than emissions from domestic production are declining. 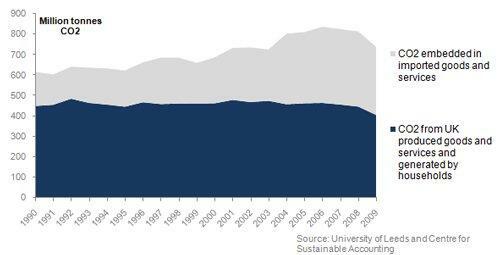 From 1990 to 2009, CO2 emitted by UK households and firms decreased by 14%. During the same period, emissions from imports directly used by UK consumers increased by 79% and emissions from imports used by UK businesses increased by 128%. Kyoto made a big mistake in declaring CO2 to be the cause of global warming. The cause of global warming is the heat emitted into the environment from the world’s energy usage. They were correct in identifying fossil fuels as a leading cause, but it is the heat from fossil fuels, as well as that from nuclear and geothermal power plants that is the real culprit. The heat alone can be easily calculated to raise the temperature of the atmosphere alone by 0.17*F a year. The actual rise has been about 25% of that due to cooling by photosynthesis and the melting of glaciers. The main damage of their declaration has been to encourage the proponents of nuclear power, and to cause much useless legislation and money and time wasted on carbon capture. All these countries send delegates to conferences to discuss climate change but you never see the role of HEAT being brought up. Kyoto “scientists” should explain why they ignored this most obvious contribution to global warming. Neither president Obama nor Dr. Steven Chu have responded to my letters pointing this out.